Deanna Kahler is an accomplished writer and proud mom. Her work has been published in numerous corporate newsletters and magazines across the country. She began writing as a young child and enjoys the opportunity to reach others and make a difference in their lives. "Echoes of Paradise" is her second book. The story is close to her heart because it was inspired by some of her own experiences. Deanna holds a bachelor’s degree in communication arts from Oakland University in Rochester, Michigan, where she graduated with departmental honors. She lives with her husband and daughter in a Metro Detroit suburb and enjoys writing, dancing, walking, and visiting parks in her spare time. 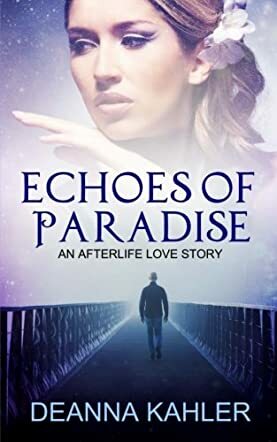 Echoes Of Paradise is the story of Celeste and Connor, a couple who had dated for a while and really had a soul connection. Unfortunately, Connor took a job out of the country so Celeste moved on, marrying Dave, even though Celeste's heart really belonged to Connor. Dave and Celeste's marriage was never really smooth sailing, and they even separated. The one good thing to come out of the marriage was Chip, their five-year-old son, and they hoped to make the marriage work for his sake. Celeste gets a message that Connor is coming home and wants to see her, but tragedy strikes and Connor never makes it home. Celeste can't get past her grief but soon notices things that really can't be explained. When Chip starts saying that he sees an angel and describes Connor, there is no doubt that he is trying to contact her. As Celeste starts to explore what happens after death, she soon learns that death, time, or space can't separate two hearts that belong together. A touching love story with a paranormal twist is what I found within the pages of this book. The characters were very well written. Dave was an okay character - I didn't like or dislike him, instead I really felt sorry for him. He loved Celeste but they were totally different; he was materialistic and she wasn't. Five-year-old Chip is a wonderful character and the author captures his essence perfectly. Deanna Kahler really takes Celeste on an eye-opening journey, and the reader goes along as well. The explanations of the spirit world really made it clear that the author did her research. Her vivid descriptions really allowed me to visualize what she was describing. While this is a fictional tale, the information that the author shares about the afterlife and what happens when we die really does enlighten and had me wanting to study this topic further. While there are several spiritual messages woven into the story, there are also more than a few twists to make for a page turning plot with an ending that was totally unexpected but fitted perfectly. Echoes Of Paradise is a satisfying read that left me feeling uplifted and encouraged.